On to day four of a week of Christmas treats. I'm realizing that it turned out to be more of a collection of food like any other week, but such is life. On of my favorite parts about Christmas at my parent's house is the random bowls around with snacks - M&Ms, caramels, Daim (one of the best Swedish candies ever), and also candied spiced pecans. I am a wary fan of nuts from the beginning. I really enjoy almonds or pistachios, but I get bored. However, when you throw a little cayenne pepper, cumin and sugar on them, you can keep them coming! 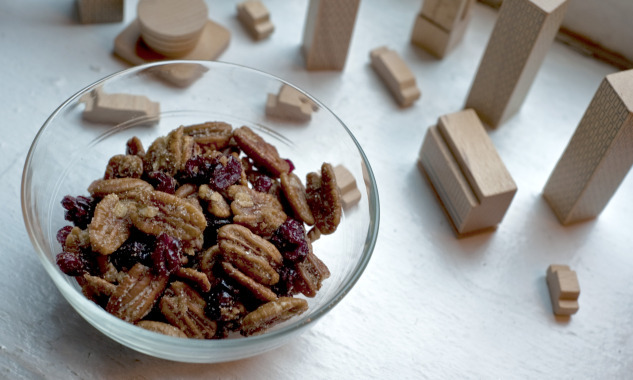 You can use any type of nut you would like for this recipe, pecans have just been the ones I traditionally use. Give these a whirl these weekend. In fact, I will probably make some more to put on my side table to nibble on as I clean the apartment, do laundry, and start wrapping Christmas presents. Mix sugar, cumin and cayenne pepper together in a small mixing bowl. Heat about 1 tablespoon oil in a skillet. Add nuts and stir until toasted. Sprinkle in sugar mixture and continue stirring until it starts to caramelize. Take off the heat and add 1/2 cup dried cranberries, if desired. Spread nuts out onto parchment paper or a baking sheet to cool.